The comments made by Gordon Dalziel, the former Rangers and Raith Rovers player who now works as a radio pundit, were nothing short of laughable. He claimed he did “not know what Shinnie brings to football and Scottish football”. But the Aberdeen captain has played every minute for his club this season. That amounts to more than 3,500 minutes of football without compromising his combative and energetic style. He has also turned up for every Scotland squad to which he has been called, which included trips to Israel and Albania where he was not selected to play. He postponed his stag do at the end of last season to play in the friendlies against Mexico and Peru when many players were dropping like dominoes. Dalziel is not the first, and probably won’t be the last, to take a potshot at Shinnie. The Kilmarnock forward Kris Boyd and Celtic captain Scott Brown have done so before. But speak to the managers that he has worked for, chiefly John Hughes and Derek McInnes, and they cannot talk up his attributes enough. Hughes was the coach who first moved him from left back to central midfield, believing in his qualities as an all-round footballer. Shinnie took to it effectively and added another string to his bow, which McInnes has honed during the player’s four years with the Dons. Shinnie also played right back under Hughes and started the 2015 Scottish Cup final against Falkirk there before switching to the opposite side after Carl Tremarco’s dismissal. At times this season, he has played off a lone striker for McInnes, leading the press from the front and using his relentless energy levels higher up the park. People criticise him for the number of bookings he collects as if he is some sort of glorified hatchet man. But look at the performances of his team when he misses out; they lack drive and a backbone. Aberdeen’s 3-0 surrender to Motherwell in the Scottish Cup semi-final last season was evidence enough of that. 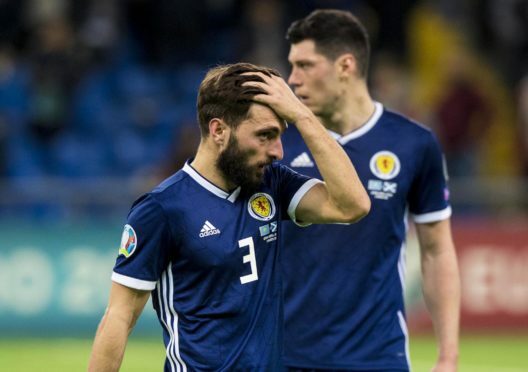 Shinnie was an easy scapegoat for a hapless display in Kazakhstan. Admittedly, he had a bad game at a position he has not played in for a while but he was by no means the only one who played poorly. He also fronted up to his mistakes in the post-match mixed zone when many would have cowered away. To say you can’t see what Shinnie brings to football says more about Dalziel than the Aberdeen captain. For a long time the Shinnie-for-Scotland drum has been banged in the north of Scotland by those who have watched him develop. To write him off after one bad game and ignore the body of work he has put in at Inverness and Aberdeen would be wrong.